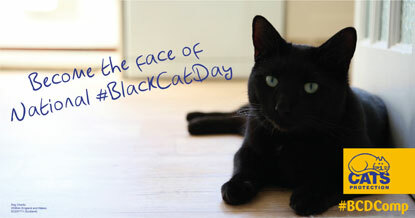 Could your cat be the face of this year’s National Black Cat Day? We’re on the lookout for a black or black-and-white cat with a winning personality to become the face of our National Black Cat Day 2016. This will be our sixth celebration of monochrome moggies; National Black Cat Day takes place once a year to help us to find homes for thousands of unwanted two-tone cats in our care. We’re running a competition for the chance for one monochrome moggy to be crowned the face of National Black Cat Day on Thursday 27 October. The theme of this year’s campaign is ‘beauty is more than fur deep’ so we’re reminding people of the many wondrous qualities that black and black-and-white cats have to offer, despite some people considering them a little mundane due to their appearance. “Black and black-and-white cats make up almost half of the more than 5,000 unwanted cats in our care, and they take around a week longer to find a home compared to cats of other colours,” says Jackie May, Cats Protection’s Digital Manager. “When people visit any of our volunteer-run branches or centres to adopt a cat, they can be faced with a large number of black or black-and-white cats and so their eyes can wander over to the brighter-coloured tabbies, torties and gingers who are in the minority and may look more exciting to adopt. If you’d like to enter the competition, which launches today, head over to our national social media channels at www.facebook.com/catsprotection or @CatsProtection on Twitter.